Download a biannual report form for program partners. Forms a strong, proactive partnership. Enhances wildlife conservation on corporate forestlands. Facilitates wildlife technical assistance, training and outreach. Publicly recognizes partners for wildlife conservation achievements. Maintains or increases opportunities for wildlife-associated recreation. In February 1996, the Wildlife Resources Division, with assistance from several other conservation organizations, joined hands with corporate forest landowners throughout Georgia and developed the FWP. This comprehensive wildlife management program helps restore and maintain critical characteristics of natural ecosystems. The program's focus is lands managed mainly for silvocultural (forest agricultural) purposes. Wildlife abundance and diversity rests largely in the hands of landowners, who own more than 90 percent of our landscape. Georgia's human population has increased steadily for decades, growing by 9.7 percent from 2000 to 2010. The population reached an estimated 10.5 million in 2018. This rapid population growth and expansion results in substantial loss and degradation of wildlife habitat. It creates a need for landscape-level planning to ensure Georgia's wildlife remain healthy for future generations. Corporations participating in FWP are among the largest landowners in Georgia. They have the potential to impact wildlife habitat on a landscape level. This public/private partnership program provides opportunities to enhance wildlife conservation practices on these lands. Companies also benefit from public recognition for current and future wildlife conservation achievements. Companies that achieve a certain level of wildlife stewardship on their lands are recognized by the state as a well-deserving partner. 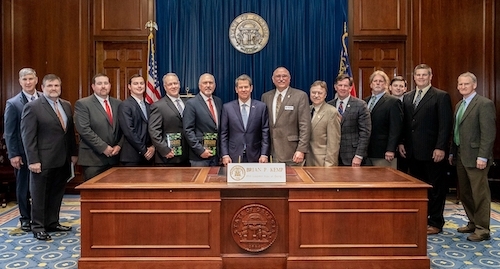 Georgia Power, Weyerhaeuser and CatchMark Timber Trust are the 2018 Forestry for Wildlife partners. agricultural and development landscapes woven by landscape-sculpting conservation plans, such as the Sustainable Forestry Initiative Inc.
For more information, please call 770-761-1697 or 478-994-7583. Landowners who own/manage 20,000 acres or more can learn more about Forestry for Wildlife Partnership by contacting Steve Raper (steve.raper@dnr.ga.gov, 404-242-4295). In 2009, the Wildlife Resources Division held a meeting to discuss the program with corporate forest landowners and managers that were not partners. Download this summary for a detailed look at FWP, including presentations from coordinators and partners. Media advisory sent before FWP presentation with the governor. Governor and Wildlife Resources Division leaders honor partners at the State Capitol. Release announcing each partner distributed to media and posted at www.georgiawildlife.com. Radio public service announcement (30-second PSA) naming partners is distributed to stations. Hunting regulations ad announces each partner (about 550,000 printed; also online). Fishing regulations ad announces each partner (about 750,000 copies printed, posted). Weekend for Wildlife announcement: FWP advertised in program and mentioned at banquet. Wildlife Resources FWP-related outreach to public and resource professionals includes presentations, articles, displays and literature. Public relations assistance such as logos, advertising material and advice provided to partners. Partner links: Georgia Power, CatchMark Timber Trust and Weyerhaeuser.